An original and very rare to find large watercolour. A stunning floral arrangement by famous Italian floral artist Ermocrate Bucchi. He is a well listed Italian artist who exhibited throughout Europe in the 19th century. 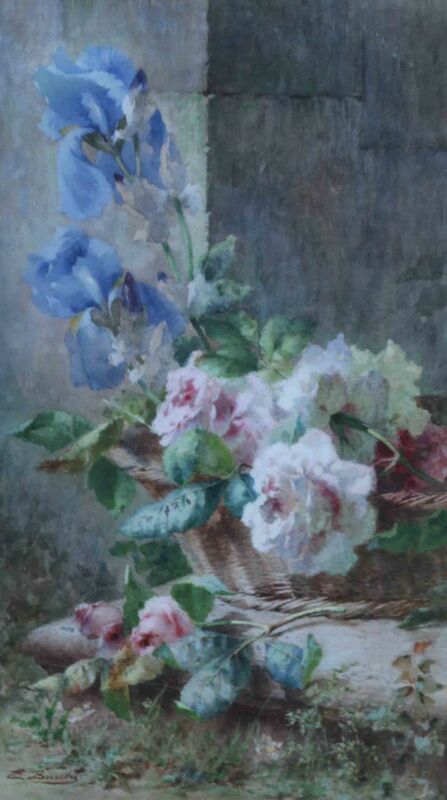 He was noted for his floral still life paintings in watercolour. 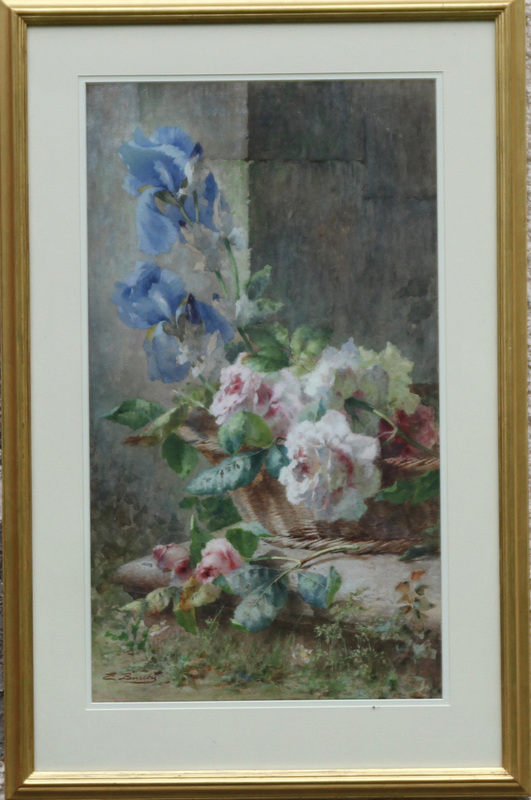 The painting depicts irises and roses in a basket and is in excellent condition in a fine gilt gallery frame. It was painted circa 1870 and has excellent provenance. A very good example of his work. Chistie’s sale 10/20/1994. Sold for £6240 plus fees ie circa £8500. Gilded frame with mount. 36 inches by 23 inches. Ermocrate Bucchi (1842-1885) was an Italian painter, mainly of still lifes with flowers. He was born in Urbino and died in Milan. As a youth he worked as a grocer, and even began a career to become a priest. He then took studies at the Brera Academy but to make a living, he worked on engraving on ivory. He became a pupil of the watercolor artist Luigi Scrosati, who trained him in the painting of flowers.This sufficed to give him a successful career. The critic Virgilio Colombo, in presenting the best artists who exhibited at the 1881 Art Show of Milan, said of Bucchi's paintings, that he sent his best watercolors of flowers to Holland; where the prominent art dealer Adolphe Goupil, of the Goupil Gallery, grouped them with Dutch flower painters, bringing much success to Bucchi. At this Exhibition, Bucchi displayed the two paintings: The seller of flowers and still life.